A simple organized way of life. I’m looking forward to just relaxing this 4th of July, spending time with family and having fun in the sun. I decided to put together small gift bags for the kids to give them some fun things to do poolside. I put all this together from the Target dollar bins and my own computer! 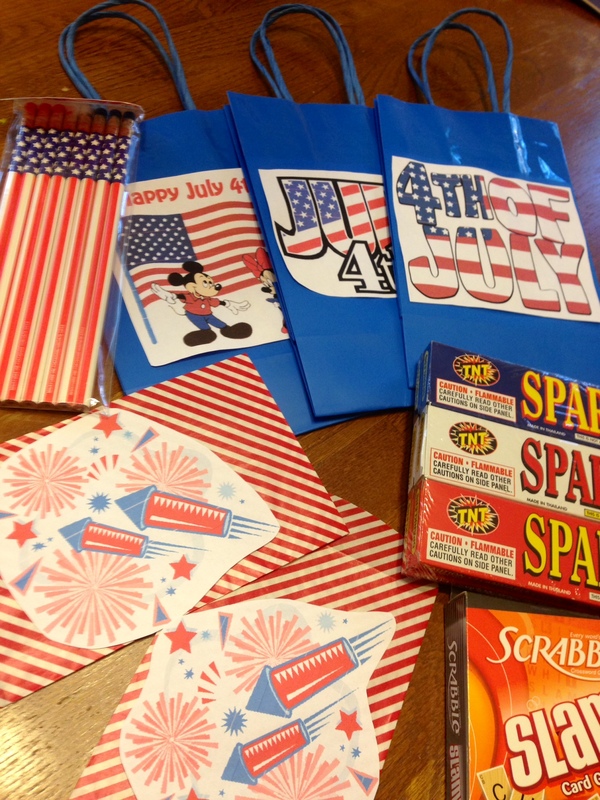 I printed out 4th of July coloring pages and puzzle pages, and clip art to decorate the bags. Then I added cards, bubbles, sparklers, pencils and mini flags. All three bags together cost less than $20. If this means not hearing “I’m bored!” that equals a deal to me! The smaller red and white striped bags are for candy. They are left over from The Cat in the Hat Party and honestly were the best purchase this year!!! I used them for Cat in the Hat, a Superhero gift for a birthday party (more on that later) and now 4th of July. Red and white stripes are very versatile!!! Wishing everyone a relaxing week and Happy 4th of July! Very cute. You found sparklers at Target?? Yes! 3 in a pack for $2! !